Thinking of a Career in Child Care? If you’d like to work in one of the many childcare jobs available today providing care and supervision for children in residential homes and non-residential child care centres, here is everything you wanted to know about this exciting profession. Childcare employment is a great place for a caring and responsible professional to make their mark in a child’s life - and with the right study and training behind you, you can be a success in any one the many available childcare jobs. The graph shows historical and projected (to 2023) employment levels (thousands) for this occupation. Over the years to 2023, the number of openings for childcare jobs is expected to be 183,900, making the vacancy level for child care worker very high. Job openings include employment growth as well as turnover. This is defined as people leaving their occupation for other employment or leaving the workforce. In the next 5 years, childcare employment will grow exponentially, creating potential job openings . The large number of childcare worker jobs (156,300 in 2018) suggest that opportunities should be available in most regions. 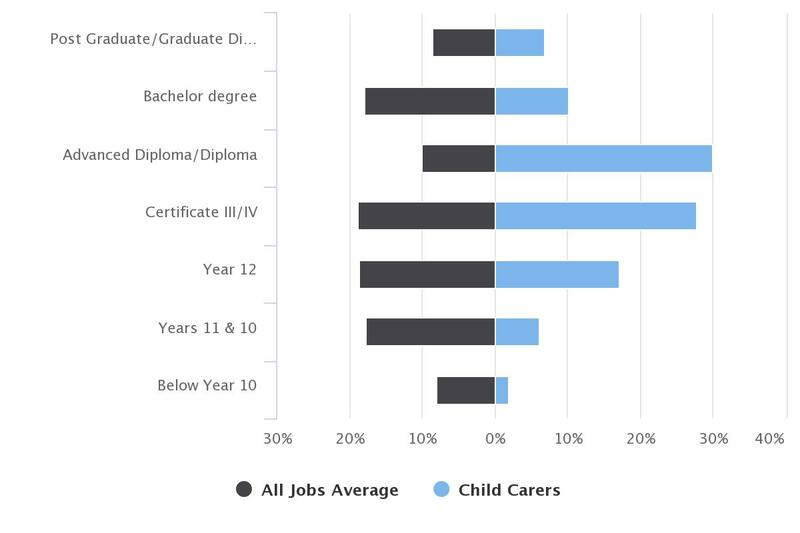 Child carer positions are expected to grow very strongly right up until 2023. Source: *Job Outlook Government website. ABS Labour Force Survey, Department of Employment trend data and projections to 2023 Government website. 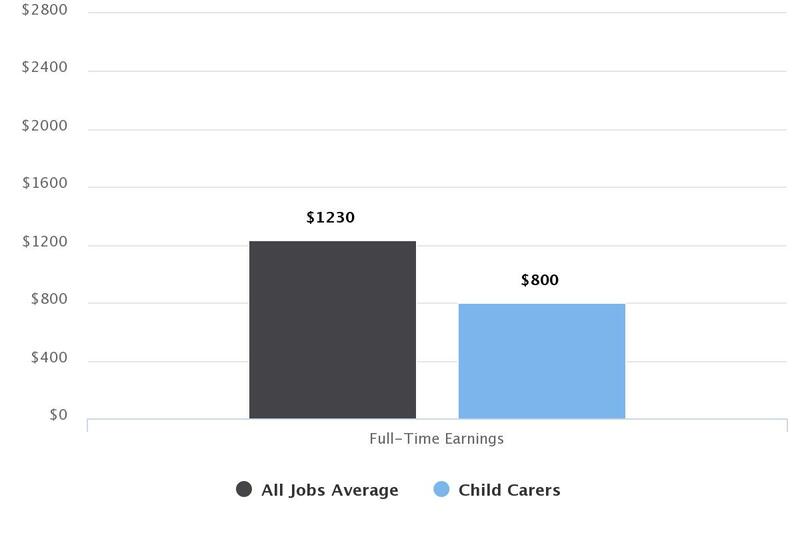 Childcare positions in Australia earn an average of $800 per week at full-time hours. Part-time they can expect to earn $614 per week within Australia. The average pay for Childcare Assistants (with five years’ experience, working in Sydney) is around $41,600 per year. Salaries vary depending on where you are located, and your level of current job experience. These figures are a guide only. The average weekly hours for Childcare positions, compared with all occupations is 35.9. Childcare employment may be full-time, part-time or casual. Source: *Job Outlook Government website. ABS Labour Force Survey, Department of Employment trend data and projections to 2023. This data shows the share of employment in percentage by age profile, when compared against all other occupations. 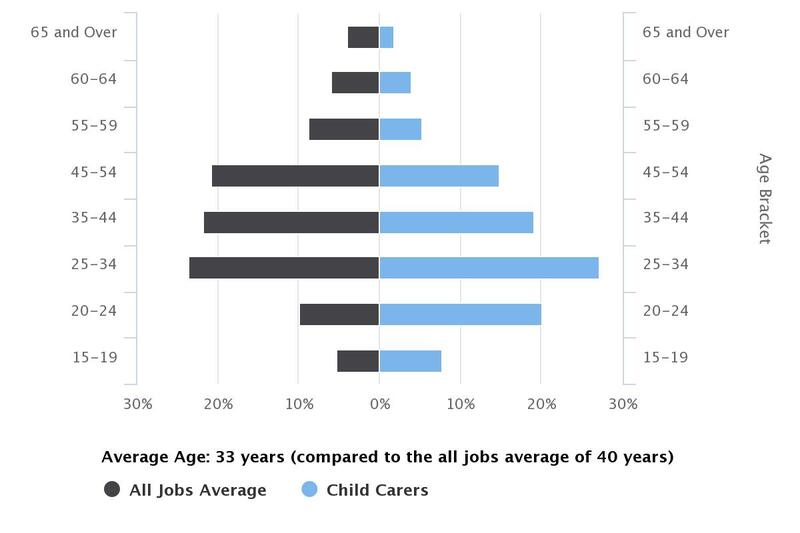 Childcare Assistants and other Child Care positions are well represented in each age category, with highest representation in the 25-34 age bracket, with around 27.2% of workers in this age group. 5.2% of Childcare workers are older than 55 while 7.8% are younger than age 19. A Productivity Commission report found that “access” and “affordability” in Early Childhood Education and Care were major issues. The Social Services Minister said, "The Australian Government currently spends almost $7 billion a year to support families to access quality and affordable childcare. It is important that these taxpayer resources are spent in the best way to enable families to stay in work, get back to work and give their children the best possible start in life." This is significant as about 1.57 million Australian children attend childcare centres. 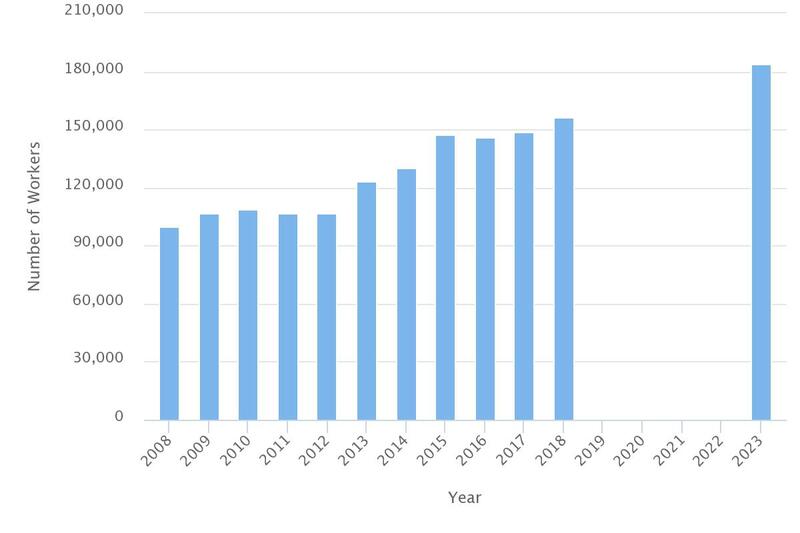 The rate of child care use in Australia increased by a massive 77% between 1996 and 2011 and the number of kids in formal care rose from 13.4% to 23.7%. Another fact: The Inclusion Support Programme (ISP) commenced on 1 July 2016, replacing the Inclusion and Professional Support Programme (IPSP) which ended on 30 June 2016. What Childcare Qualification Do You Need? Suitable for those with some childcare experience who are seeking to formalise their knowledge, and also suitable for new entrants wanting to get started in Childcare. Why Study Childcare through Open Colleges? Our childcare courses are delivered online, giving you the flexibility of organising your study around your life. You can enrol anytime of the year and study at your own pace. Discover more about this profession with this infographic Your Career in Education and Training. Among other things, you'll learn how to contribute to provision of nutritionally balanced food in a safe and hygienic manner and how to work within a relevant legal and ethical framework. Read Child Care Advice from Industry Professionals. You’ll also learn how to participate effectively in the work environment, support behaviour of children and young people and to work effectively with families to care for the child. Discover what Child Care Experts and Students Like About Working in The Industry. Your course includes comprehensive student support to help you throughout your study. Some of the diplomas and certificates allow you to graduate with a government-accredited, nationally recognised qualification that can boost your chances of employment. Learn more about DIY Learning here. Tell us a bit about your role in the child care industry. As a co-educator I work as part of a collaborative planning team who work together to support the routines of young children and scaffold their play to promote learning. Within this environment my roles include setting up learning experiences, making observations of children’s skills and interests and documentation. What does a child care worker do on an average day? It is important in an early learning environment for there to be routines in place to help support and foster and strengthen the knowledge that young children have. Our day to day activities follow a topic of inquiry that has been developed around the interest of the students and the observations that have been made. Within a typical day you will be playing with the children and doing small and large group activities that help to support certain outcomes of learning. The best part of my job is seeing the developmental progress that takes place, in particular the joy on a child’s face when they are able to achieve something that was too difficult before. What sort of skills and attributes does a child care worker need to have? When working with young children you need to be compassionate, flexible and patient. You need to be a good communicator and use your initiative. What are your favourite things about working in the childcare industry? Working within the early learning industry is very rewarding. As you are working closely with a team of peers it gives you a chance to gain and share knowledge on a day to day basis. It is being a part of a community built up of the children you work with, their families and your peers within the work place and the wider community. It is a very practical occupation that keeps you constantly on the go with many rewarding challenges. Thanks, Tracey, for sharing your story with Open Colleges. Ready to take the next step towards a rewarding career in Childcare? If you’re passionate about children's education and development, managing children's behaviour and have been wanting to change jobs or begin a new career in child care employment. Fill in your details below to receive a course guide and a consultation with an Enrolment Consultant. Find Your Awesome with Open Colleges today!